Apple Launches a New iPad: Here’s The Breakdown! 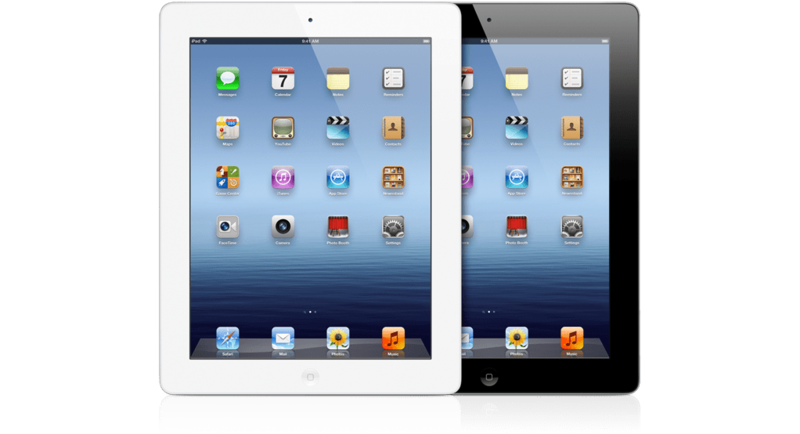 Apple recently released the update to its popular tablet device, the iPad. Instead of being called the iPad 3, this new iPad will be called exactly that, “the new iPad”. Why the change in the name? Apple claims that the move to drop the numbering system for the iPad is because the iPad is meant to serve as a replacement to standard laptop PC. The MacBook and iMac product lines are not numbered, and now the iPad isn’t, either. Despite my initial misgivings about this, I have to say that this was a good call by Apple. The older iPads are out of date, and when a standard consumer looks for a new iPad, they will buy the new one as it comes out, trusting Apple to put the best specifications in to the new model. The new iPad, in addition to the name change, also offers several new features and updated specs. The first major difference between the iPad 2 and the new iPad is the display. The retina display, also featured on the iPhone 4, increases the number of pixels in the screen drastically to improve the viewing quality and making images look sharper. In fact, Apple claims that the iPad has a million more pixels than an HDTV! The technology of the Retina display is incredible, and if you want to see how Apple engineers managed to fit so many pixels in such a small area check out this video. The next major upgrade of the new iPad is the new processing chip, the A5X. The A5X is a quad-core processing chip that makes gaming on the Retina display look absolutely stunning, without any lag. The new chip still manages to conserve the battery life of the iPad, know for its longevity, to 10 hours with standard usage. Another major upgrade Apple made to the hardware of the device is the iSight camera. The new iSight camera is 5 megapixels and records 1080p HD video, but that’s not what makes it amazing. As any camera aficionado knows, more megapixels does not always mean a better picture, and Apple had this in mind when designing the new camera. The new iSight features advanced optics technology to make the best use of the lighting of an area, and uses advanced features like IR light filtering that is typically used in high-end cameras. All of this comes together to produce beautiful images that look absolutely stunning on the new iPad’s Retina display. A major upgrade that Apple users have been waiting for is 4G internet connection. 4G speeds means incredibly fast internet and the end of looking for free Wi-Fi while on the go. The iPad also offers tethering, so the iPad can serve as a mobile hotspot for your iPhone or other devices. Apple is finally making the move to supporting 4G, and now it is only a matter of time before it makes its way to the iPhone. Apple, in an effort to make the iPad closer to the desktop experience, launched the full iOS version of iLife. This means that iPhoto, iMovie, and Garageband are now available on the App Store to download. The iLife suite allows users to effectively manage their photos, movies, and music on the go, allowing iPad owners to get rid of their computers completely and still be able to access and edit their important files. Combined with iWork, iLife allows users to work and play on the iPad in a way that was previously impossible, meshing the desktop and tablet experience. Since the release of Siri on the iPhone 4S, questions of how the iPad will incorporate this feature have been flying around the internet. The new iPad finally answers these questions simply: it won’t. The iPad’s screen is too big to accommodate the bar on the bottom for Siri, and no one takes out an iPad just so that they can make a quick reminder to themselves. However, the iPad does not totally do away with voice control, as it adds dictation. The keyboard in the new iPad has a microphone icon identical to Siri’s which, when pressed, allows the user to speak out what they would have typed. This feature works in every application, making it easy to type out long emails or make a Facebook status without setting down your iPad to type. An interesting feature that Apple included in the new iOS built for the new iPad is AirPlay mirroring. This feature allows the screen of an iPad to be projected on to a TV screen with an Apple TV connected to it. Apps can be opened to show presentations and games can be played on the large screen for everyone to see. This feature is incredibly helpful for using the iPad in the classroom as well, allowing teachers to work a math problem or read a book in real time through a TV screen. The new iPad isn’t a revolutionary change from the iPad 2, but it adds some much needed hardware improvements that make it a great buy. Apple looked to combine the PC and tablet experience with the new iPad, creating an impressive and great looking product. Many of the new changes made to the iPad were carried over from the iPhone 4S, such as the Retina display, and others were expected, such as 4G and the new processing chip. However, Apple, as with all of their products, managed to incorporate new ideas and subtle changes that make the iPad great. What are your thoughts on the new iPad? Do you feel that Apple left anything out in its design?